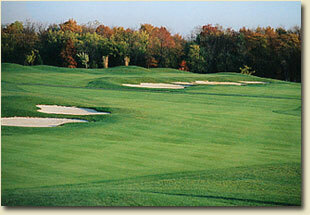 Darby Creek Golf Course sits on 204 naturally rolling acres located in the rural southeast corner of Union County. The course layout takes advantage of this setting by blending in with the pristine countryside that surrounds it. A portion of the golf course was formerly home to The Ohio Orchard Company from the 1920's to mid 1980's. The orchard drew people from long distances with their apples, peaches, cherries, strawberries and melons. Four cherry trees still stand at the entrance to the golf course. Sitting next to hole #4 tee box is the Woods-Reeds Cemetery, the site of the first Presbyterian Church in Union County est. 1800c until it burned down and was rebuilt in nearby Milford Center. The golf course maintains the cemetery which consists of approximately 30 graves dating in the 1800's. The oldest identified is that of Rev. Samuel Woods the first pastor of the church who was laid to rest at the ripe old age of 36 in 1815. The woods throughout the back 9 were a favorite for sugar camps set up to draw syrup from the many maple trees. A large rock next to #14 tee box marks a grave of an unknown individual. Local folklore has it is the result of an argument between two brothers who had over indulged in sugar beer from their still. Darby Creek Golf Course was designed by the world-renowned architect team of Geoffrey Cornish and Brian Silva of Amherst, MA. The golf course was opened for play in the spring of 1993. 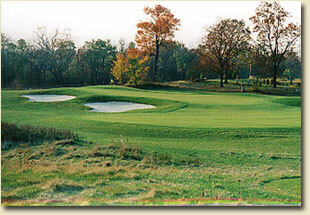 Darby Creek is unique in its design with two distinctively different nine-hole layouts. The front nine "The Links" was created on the old orchard site. It captures the appearance and feel of a windswept Scottish links course with an emphasis on natural grasses and sand bunkers to create the definition of each hole. The back nine "The Woods" follows the more traditional American layout as it cuts through with treelined fairways and greens highlighted by strategically placed lakes and sand bunkers. With multiple tee locations and yardage ranging from 5,200 to over 7,000 Darby Creek offers the perfect balance between playability and challenge for golfers of every ability level. The unique design of Darby Creek's clubhouse offers a spectacular view of the golf course through a glass wall that spans an entire side of the dining room. The clubhouse features a restaurant, a fully stocked golf shop, locker rooms with showers, a meeting room, patio seating and an outside pavilion area. The staff at Darby Creek Golf Course appreciates those who love the game of golf no matter their ability level and is dedicated to making every golfer's experience an enjoyable one. Darby Creek Golf Course is definitely a drive worth remembering!